Definition at line 4 of file surface.h. Definition at line 6 of file surface.h. 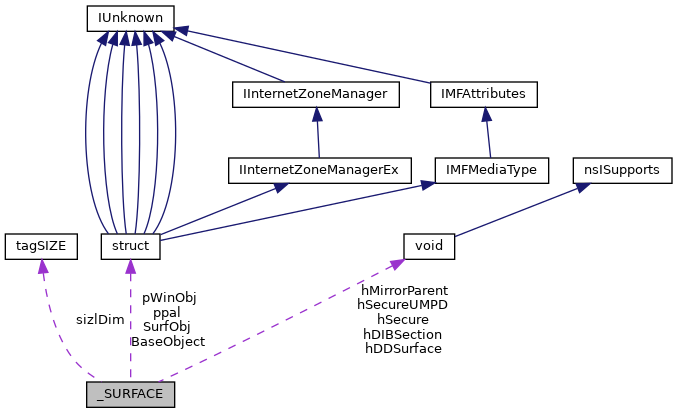 Referenced by EngCreateBitmap(), EngCreateDeviceBitmap(), EngCreateDeviceSurface(), EngDeleteSurface(), EngSetPointerShape(), IntEngMaskBlt(), NtGdiCreateBitmap(), NtGdiGetDCObject(), NtGdiGetPixel(), NtGdiSelectBitmap(), PDEVOBJ_pSurface(), SURFACE_AllocSurface(), and SURFACE_ShareLockByPointer(). Definition at line 37 of file surface.h. Definition at line 27 of file surface.h. Definition at line 33 of file surface.h. Referenced by BITMAP_GetObject(), and SURFACE_vCleanup(). Definition at line 10 of file surface.h. Referenced by BITMAP_CopyBitmap(), DbgDrvBitBlt(), DbgDrvCopyBits(), DC_bIsBitmapCompatible(), EngAssociateSurface(), EngCopyBits(), EngModifySurface(), GreCreateBitmapEx(), IntCreateCompatibleBitmap(), IntEngAlphaBlend(), IntEngBitBlt(), IntEngEnter(), IntEngGradientFill(), IntEngLineTo(), IntEngPaint(), IntEngStretchBlt(), IntEngTransparentBlt(), NtGdiCreateBitmap(), NtGdiDdDDICreateDCFromMemory(), and NtGdiSetBitmapBits(). Definition at line 26 of file surface.h. Referenced by DC_vSelectSurface(), IntCreateCompatibleBitmap(), NtGdiGetDCforBitmap(), and NtGdiSelectBitmap(). Definition at line 18 of file surface.h. Definition at line 31 of file surface.h. Definition at line 17 of file surface.h. Definition at line 28 of file surface.h. Definition at line 32 of file surface.h. Referenced by BITMAP_GetObject(), DC_bIsBitmapCompatible(), GreGetDIBitsInternal(), NtGdiSelectBitmap(), and SURFACE_vCleanup(). Definition at line 16 of file surface.h. Definition at line 11 of file surface.h. Referenced by BITMAP_CopyBitmap(), BITMAP_GetObject(), EBRUSHOBJ_bRealizeBrush(), EBRUSHOBJ_vInit(), EXLATEOBJ_vInitXlateFromDCs(), GreGetDIBitsInternal(), GreGetSetColorTable(), GreGradientFill(), GreSetPointerShape(), IntCreateCompatibleBitmap(), IntExtTextOutW(), IntSetDIBits(), NtGdiExtFloodFill(), NtGdiGetPixel(), NtGdiSetDIBitsToDeviceInternal(), NtGdiTransparentBlt(), SURFACE_vCleanup(), TranslateCOLORREF(), and UserDrawIconEx(). Definition at line 21 of file surface.h. Referenced by GreGetBitmapDimension(), and NtGdiSetBitmapDimension(). Definition at line 8 of file surface.h. Referenced by BITMAP_CopyBitmap(), BITMAP_GetObject(), DC_bIsBitmapCompatible(), EBRUSHOBJ_bRealizeBrush(), EBRUSHOBJ_psoMask(), EBRUSHOBJ_psoPattern(), EngAssociateSurface(), EngCreateBitmap(), EngCreateDeviceBitmap(), EngCreateDeviceSurface(), EngLockSurface(), EngModifySurface(), EngRealizeBrush(), GreCreateBitmapEx(), GreGetDIBitsInternal(), GreGetSetColorTable(), GreGradientFill(), GreSetPointerShape(), GreStretchBltMask(), IntCreateCompatibleBitmap(), IntEngMaskBlt(), IntExtTextOutW(), IntFillPolygon(), IntFillRect(), IntGdiLineTo(), IntGdiPolygon(), IntGdiPolyline(), IntHideMousePointer(), IntPatBlt(), IntRectangle(), IntSetDIBits(), IntShowMousePointer(), NtGdiAlphaBlend(), NtGdiCreateBitmap(), NtGdiDdDDICreateDCFromMemory(), NtGdiExtEscape(), NtGdiExtFloodFill(), NtGdiGetBitmapBits(), NtGdiGetPixel(), NtGdiMaskBlt(), NtGdiSelectBitmap(), NtGdiSetBitmapBits(), NtGdiSetDIBitsToDeviceInternal(), NtGdiStretchDIBitsInternal(), NtGdiTransparentBlt(), PDEVOBJ_vSwitchPdev(), POLYGONFILL_FillScanLineAlternate(), POLYGONFILL_FillScanLineWinding(), SpiSetWallpaper(), SURFACE_AllocSurface(), SURFACE_vCleanup(), TranslateCOLORREF(), UnsafeGetBitmapBits(), and UserDrawIconEx().